After a long day on the trail, few things feel as important as getting a hot meal in your belly. If you’re lucky, that sometimes means T-bone steaks cooked over an open fire in a cast iron skillet. But for most of our backcountry adventures, dehydrated chili out of a Mylar bag is the more likely option. To turn that chili from its inedible freeze-dried state into a hot meal, you’ll need to be able to boil a liter or so of water. Fortunately, a high-quality camping stove can provide that in ten minutes or less. These stoves come in wide variety of styles, and if you’re unfamiliar with them, choosing one can feel like a daunting task. We’ve set out below some times for how to choose the best camping stove. What should I look for in a good camping stove? What about an integrated pot camping stove? Which camping stove is right for me? Let’s start with the basics: when you’re on the trail, you’ll want something that can cook your food quickly and without too much fuss. The best camping stove for you will depend on how you intend to use it, and below are some of the factors to consider. The first thing you’ll need to decide is whether you want a camping stove that uses a canister or one that runs on some sort of liquid fuel. Canister camping stoves use isobutane, a relatively soot-free, high-heat fuel. Fuel canisters are available at most sporting goods stores, and usually cost around $7 for an 8-ounce canister, which will boil 10-15 liters of water. One of the biggest upsides to canister camping stoves is that they’re incredibly lightweight. The canister serves as a base that the stove itself screws into, minimizing weight and volume. This makes them a favorite among lightweight backpackers. The downsides are that they’re bulky and you have to pack out spent canisters. Isobutane is also typically only available at sporting goods stores and the camping section of some hypermarket/big box stores. In rural areas with only a few small convenience stores, you’ll be out of luck. The same is true if you’ll be camping abroad in a country that uses a different connector that’s not capable with North American stoves (most other countries). Additionally, if you’ll be flying to your camping destination, isobutane canisters cannot be taken on a plane, in either checked or carry-on baggage. They’re considered a hazardous material, so you’ll need to purchase one once you arrive. It’s also difficult to know how much fuel is left in the canister and whether you’re about to run out. You can count minutes of burn time, but unless you always have the camping stove running at full capacity, it’s an imprecise measurement. You can use an electronic scale, like the kind used for weighing small packages, to determine how many ounces are left in the canister. Ultimately, though, many hikers have a shelf of half-used canisters they’re always afraid to pack on their next trip. A popular alternative to canister stoves is the liquid fuel camping stove. These can run on a variety of types of fuel: kerosene, gasoline, methanol, etc. That makes them perfect for traveling internationally, where camping stores might be non-existent but gas stations are ubiquitous. These camping stoves are quite a bit more expensive than the canister setups, though, mostly because they have more parts: fuel bottle, fuel line, burner, and windscreen. Liquid fuel stoves are also considerably more difficult to use, so they’re a poor choice for anyone who doesn’t have much patience when they get to camp. Part of the difficulty in using liquid fuel stove is that they require priming - a process that involves lighting a small amount of fuel on the surface of the burner and pressurizing the vapors inside the fuel bottle to get a constant flow of gas towards the burner. It can take some practice and a few minutes of your time, but once the gas gets going, it’s pretty worry-free. When hiking at high altitudes, where the air is thinner and the temperatures are lower, liquid fuel is definitely the way to go. Canister stoves don’t work well at below-zero temperatures, and they’re useless above 14,000 feet. Liquid fuel stoves are also good for camping with a large group, as the standard 600-milliliter fuel bottle is sufficient for boiling between 24 and 36 liters of water, which is plenty for a weekend trip. Larger bottles are also available if you’re thinking about doing a longer hike. If neither liquid nor canisters are quite what you’re looking for, there are a few alternative fuel options. One of the most popular is the alcohol stove, a favorite among ultra-lightweight backpackers. For decades, it was a rite of passage for DIY-minded backpackers to carve their own out of a soda can. Just cut the can in half, place one section inside the other to create a sturdy base, and poke a few holes in the sides for airflow. Fortunately, a few companies are producing purpose-built alcohol camping stoves that are a bit more durable and produce a better flame. Either way, these stoves only weigh a couple ounces, and they work with a readily-available fuel source (isopropanol is sold at many gas stations in the form of HEET, a fuel additive), making them a popular choice for hikers on the Pacific Crest Trail and other long-distance routes where resupplying might be challenging. Another possible option is a wood-burning stove. After all, wood was the original fuel source, used by humans to cook their food for thousands of years. Fuel for these stoves can be scavenged from around the campsite, which makes them a good choice for survival situations. However, wood doesn’t burn as hot as fossil fuels, which means you’ll be spending more time waiting for that liter of water to boil. If you primarily eating dehydrated meals when in the backcountry, you might want to consider an integrated pot camping stove, which are purpose-built to boil a liter of water. These stoves run on isobutane canisters and consist of an insulated pot connected to a heat exchanger, and are designed to minimize heat loss and maximize fuel efficiency. The downside is that they take up a bit more space (compared to boiling water in a metal cup or something similarly small) and you lose some flexibility. The tall, narrow pots are optimized for boiling a liter of water and nothing else. You won’t be cooking up homemade pasta or chili in one of these. That all depends on which type of camping stove you’re using. Canister stoves, particularly those with an integrated pot, boil water faster than most other types. They’re less susceptible to wind and the fuel burns hotter, meaning they can require less fuel. The amount of fuel consumed will depend on how you adjust the flame, as a stove at full-throttle can go through a canister very quickly. On a liquid fuel stove, you should reliably get a liter of water boiling for every ounce of fuel used. You can bring that up to 1.5 liters using white gas (naptha), which is much more refined and clean-burning compared to standard unleaded gasoline. Alcohol stoves are a bit less efficient, so you’re looking at 1.25 ounces of methanol to bring a liter of water to a boil. The minimalist design of alcohol stoves also makes them very susceptible to flameout from wind, so be conservative with your fuel estimates. Lastly, the amount of fuel needed for a wood-burning stove is all over the map, depending on the type of wood (hard woods like ash or birch burn hotter than soft woods like pine or spruce), its moisture content, and how well you stack it inside the stove. Fortunately, you should have a ready supply of wood at any campsite, so this isn’t really an issue. When MSR released their first version of the Pocket Rocket many years ago, it was hailed as one of the best lightweight canister stoves ever made. It was reliable, burned hot, and weighed next to nothing. When they announced a second version of the famous stove a couple years ago, it was hard to see what could be improved. Well improve they did. The new iteration is more fuel-efficient, more stable, and has the same great boil time as its predecessor. It also only weighs 4.2 ounces, including a plastic carrying case. The Pocket Rocket 2 will get a liter of water boiling in a blazing three and a half minutes, the fastest of any stove on this list. If you don’t want the stove to heat at maximum capacity, it’s easy to regulate the flame with a few quick turns on the side adjustment knob. One issue with the Pocket Rocket is a common problem for almost all canister stove systems. Since the fuel canister acts as a base, you’ll need to find a flat surface to cook on. It can get quite tippy if used somewhere that’s not level - a dangerous situation when you’re dealing with boiling water. The Pocket Rocket 2 is one of the all-round best camping stoves on the market and would be a great addition to just about anyone’s kit. JetBoil has led the way when it comes to integrated pot stoves for backpacking, producing some of the fastest and most fuel-efficient stoves on the market. The Flash can boil a liter of water in just six minutes, and thanks to its highly efficient heat exchanger, you should be able to get about 12 uses out of each fuel canister. It also has a temperature indicator on the side, which is nice if you’re not trying to reach a full boil like with coffee or tea. 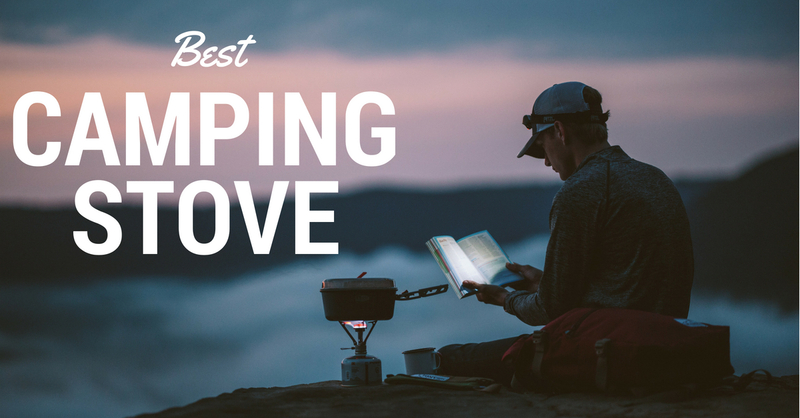 The Flash is one of the heaviest camping stoves on this list at 13.1 ounces (without the canister), although you won’t need to carry a pot. It also costs twice what a comparable isobutane stove without an integrated pot would, so consider how much you would be spending on cookware. One of the biggest downsides to the Flash, or any integrated pot, is the lack of versatility, since they’re not very useful for anything besides boiling water. As with most integrated pot stoves, the Flash comes with three legs that attach to the fuel canister to create a more stable base. Unfortunately, with the short base legs, it still feels like it could tip over on an uneven surface. You’ll also realize pretty quickly that the stove doesn’t work in windy conditions; anything over 20 mph will actually blow the flame out. Jetboil’s Flash is ideal if you just need to boil water and want to do it quickly while using as little fuel as possible. It’s not for everyone, but it works well for backpackers who only eat dehydrated meals and hike in non-windy conditions. While canister stoves are highly effective at boiling water for your dehydrated meal, what if you want a more elaborate culinary experience? Liquid fuel stoves give you that option, operating more like your kitchen stove, with relatively inexpensive fuel and a more comfortable surface to cook on. This is one of the reasons the Whisperlite is one of the best camping stoves; you can boil, simmer, and even create a makeshift oven using the “Tower of Power” method. The little burner can comfortably hold a pot, unlike the tippy canister stoves. The Whisperlite is also great if you’re traveling internationally, since you can bring the fuel bottle empty on the plane and fill it with any number of cheap fuels at your destination. It’s a lot less hassle than trying to find a store that sells isobutane. No spent canisters to carry out to the trailhead trashcan, either. One of the disadvantages of the liquid fuel stoves like the Whisperlite is that it’s a bit harder to operate and can take some getting used to. Practice at home until you’re proficient; the backcountry is no place to struggle with your stove. Given that this stove is a bit more complicated than the canister varieties, it also has a slightly higher price tag. The Whisperlite costs double what a simple canister stove would, but that includes a fuel bottle, fuel line, burner, and windscreen. That windscreen is critical for keeping a hot flame in windy conditions. MSR’s Whisperlite is an excellent choice for anyone who’s cooking for a large group, traveling internationally, or just doesn’t like the idea of throwing away gas canisters after every trip. It’s a bit more challenging to use, but nothing a little practice can’t fix. While many DIY-minded ultralight backpackers have made an alcohol stove out of a discarded soda can, Trangia and a number of other companies have made some improvements on the homemade design. Trangia’s version of the alcohol burner comes in at just 4 ounces without fuel and takes up less space than two decks of cards. It costs about a third to half of what you’d normally to pay for an isobutane stove, too. To get this camping stove going, just pour in an ounce of fuel, spark it with a fire steel, and get to cooking. A small control ring on the top of the stove can be used to adjust the flame level. One of the Trangia’s biggest advantages is the ubiquity of its preferred fuel source, methanol. HEET is available at just about every gas station, and you can also use 91% rubbing alcohol, available at drug stores, or denatured ethanol, which can be found at most hardware stores for a couple dollars per liter. The downside to using alcohol is that it doesn’t produce as much heat as other types of fuel, so it can take eight to fifteen minutes to boil a liter of water. Performance degrades even further at high altitude and in cold weather. Another concern with the Trangia and other alcohol stoves is that most alcohol fuels produce little to no visible flame, which makes it hard to tell if you’ve fully snuffed it out. BioLite made a name for itself as a company manufacturing clean burning cook stoves for use in the developing world. Unlike the other stoves reviewed here, the BioLite is designed to burn wood. It also uses a thermoelectric generator to produce electricity that can charge a cell phone, GPS receiver, or any other electronic device that can be charged with a USB port. Let’s start with the fuel source. Wood sounds great, it’s readily available near just about every campsite, and it’s got a traditional feel to it. However, since wood doesn’t burn as hot as fossil fuels, the BioLite will take at least twice as long to boil your water compared to other stoves. On the other hand, the thermoelectric generator is a nice perk, since you can charge your devices while you wait for your water to heat up. Unfortunately, charge a completely dead iPhone battery takes 4-5 hours. If you’re someone who enjoys having a job at camp, tending the BioLite’s flame will be a full-time job keeping the electricity flowing. Do you hate the idea of throwing away used gas canisters after every trip? The Biolite will keep you trash-free - however it does create ash, and a fair amount of it. You’ll need to empty out the ash container about once an hour. All in all, the BioLite appeals to narrow group of customers - those who want a camping stove that runs on renewable resources, can charge their electronics, and aren’t pressed for time. For most hikers, MSR’s Pocket Rocket 2 is the best camping stove for the job. It burns hot, boils water quickly, and packs down very small. The isobutane fuel will only be a problem if a small number of situations, namely cooking for large groups or traveling on a plane. In those less common situations, the Whisperlite will work great; its only major problem, ease of use, will diminish with experience. It’s a great secondary option if you’re not interested in carrying isobutane canisters or you want to be able to cook something fancier. Alternative fuel stoves like the Biolite and Trangia have their place, but most users won’t see enough benefit to make either one their go-to stove. No matter which stove you choose, always be conservative with the amount of fuel you bring. A few extra ounces of fuel isn’t going to noticeably weigh you down, but nobody wants to get stuck eating cold noodles and oatmeal because they didn’t pack enough gas!